Posted on Thu, Oct 8, 2009 : 2:11 p.m. 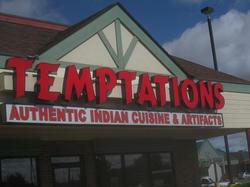 The late, lamented Temptations, 2876 Washtenaw, reopens under new management Oct. 15. On Oct. 15, local taste buds will again be tempted by the savory Punjabi cuisine of Temptations, which closed back in March much to the disappointment of lovers of the restaurant’s authentic style of Indian food. The new team also includes Executive Chef Panna Lal Sharma, former personal chef to Indian presidents and prime ministers, including Indira Gandhi. But don’t let his lofty credentials, which include a gold medal from an international competition held in France, put you off—Temptations aims to be accessible to all. “Everyone” especially includes students, Bose added. A special section of the restaurant, in fact, will be set aside just for them. It will include wifi access, extended hours, a television, places to study, and an “economical” menu designed for the typical student’s tight budget. The main restaurant will offer lunch and dinner buffet style, with daily specials, soups, salads, kabobs, different types of naan (oven-baked flatbreads popular in South Asia), and more. EntrÃ©e examples include Chicken Dolma (breast stuffed with chopped veggies in a nut-based sauce), Tandoori Hariyali Kabob (grilled mashed greens and cottage cheese with spices), and Lobster Lazeez (tails cooked in tomato sauce with rice and a creamy spinach sauce). For weekend brunches, there will be a “chaat station” serving snacks and appetizers such as potato patties and garbanzo beans with yogurt, mint, and tamarind sauces. Perhaps the most intriguing aspect of the new Temptations is the opportunity to “co-create” a dish with chef Panna Lal Sharma and his team. “With enough advance notice, our chef can take your idea for a dish—whether Indian or Thai or whatever; he is skilled in many cuisines—and create something delicious to exceed your expectations,” said Bose. Temptations will also offer cooking classes, where participants can go through the process of creating Indian dishes including naan, Tandoori Roti, and Chicken Tikka Masala in the restaurant’s open kitchen architecture. Catering is available for corporate events, parties, weddings, and more, and eventually a bar will be added to the dining area once all the appropriate bureaucrats are happy. For the first two weeks, the restaurant will feature expanded buffets—“we’ll have a wider variety, like a food festival,” said Bose—in celebration of the grand opening. Sounds pretty awesome to me. And here’s a free recessionary tip (you're welcome): Get your hands on the current issue of Clipper magazine for the restaurant’s prominent ad, which includes a buy one entrÃ©e, get one free coupon. Temptations, 2876 Washtenaw, is (or will be) open for lunch weekdays from 11 a.m. to 2 p.m. and weekends 11:30 a.m. to 3 p.m. Open for dinner Monday through Thursday 5:30-10 p.m, Friday and Saturday 5:30-10:30 p.m, and Sunday 5-10 p.m. Student lounge open 11 a.m. to close every day. David Bardallis is a freelance writer and editor, blogger, bon vivant, and man about town. Visit his Web site, DavidBardallis.com, to engage his services or read his latest. Thu, May 27, 2010 : 8:50 p.m.
Food was terrific! We thoroughly enjoyed the meal. The service was also excellent. Sun, Oct 11, 2009 : 1:28 a.m.
Now if we could only get a REAL Spanish restaurant in this area! Oh yes... and balti food which is Pakastani. I had some in the UK and it was amazing! Fri, Oct 9, 2009 : 11:49 p.m.
Fri, Oct 9, 2009 : 9:42 a.m. So excited!! Thanks for the sleuthing, Dave! We were all hearing rumors - so glad to have confirmation. Fri, Oct 9, 2009 : 7:40 a.m. Being Indian, I like the food at Temptations. My only complaint was this- they always put out too little food in their buffet trays,and they wouldnt refill the trays fast enough. Plus the wait staff werent enthusiastic about doing their work- i.e., they took their own sweet time refilling one's water glass etc. Lets hope their staff does a better job in this new incarnation of Temptations. Thu, Oct 8, 2009 : 4:24 p.m.
Seconded! Temptations is probably my second favorite Indian restaurant in Washtenaw County and I've been jonesin' for its return. Thu, Oct 8, 2009 : 4:21 p.m.
Ann Arbor food boards have been buzzing about this - thanks for the update!